Fight To Win continued its pro tour stop in Cleveland, Ohio where Vitor Oliveira faced Keith Miner in the no-gi main event of F2W Pro 69. Oliveira quickly brought the match to the ground with a swift foot sweep on Miner just nine seconds into the bout. The GF Team veteran then applied heavy pressure, cutting through Miner’s guard and earning side control within the first minute. 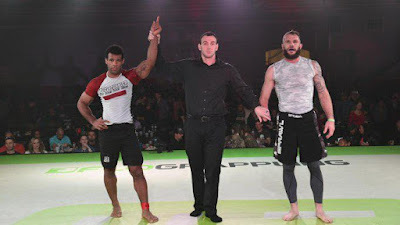 The two then battled for the takedown with arm drags and foot sweep attempts before Oliveira forced his opponent again to the mat around the 2:30 mark. It was obvious that Oliveira wanted nothing to do with the attempted leg entanglements by Miner, and worked to quickly get by the guard with powerful passing. The multiple takedowns and submission attempt by Oliveira earned him the decision. The three refs unanimously raised their flags for Oliveira after the 8-minute round was over.